Paul Weller Interview With The Sunday Mirror! – Paul Weller News! Exclusive: Paul Weller may have turned 50, but he says he won’t rest on his laurels! As his female string section file into a West London rehearsal room, Paul Weller sits on a wall outside blinking in the sunshine, sipping tea and smoking Benson & Hedges. In May, the Britrock legend turned 50 having just delivered the greatest, most surprising, album of his career. Featuring collaborations with Robert Wyatt and Noel Gallagher, 22 Dreams is a captivating 2CD set. It covers everything from the Modish punk rock Weller first found fame with in The Jam, the jazzy adventures he undertook in The Style Council, as well as forging previously unchartered adventures in avant garde, krautrock and nu-folk territory. It’s a record full of ambition and adventure – decidedly not the work of a man settling down for a quiet easy-going middle age. “You can’t really plan for those things, but I did have big ambitions for it starting out and they developed as it went along,” agrees Weller. So how did it feel turning 50? “It was quite monumental leading up to it, but I’ve been enjoying it so far. I couldn’t pinpoint how it’s changed me. Whatever it is, I’ve enjoyed it. Part of the thing of getting older I find is that you care far less what people think. 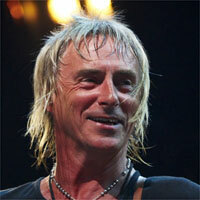 Weller staged a remarkable comeback as a solo performer at the start of the 90s. Since then, however, he’s been criticised for his dadrock conservatism. 22 Dreams is a defiant response to such putdowns. Recorded at his countryside studio, 22 Dreams reflects Weller’s connection to nature as much as the big city, something that’s always been present in his music, right back to The Jam’s acoustic classic English Rose. “Woking, where I come from, is suburbia but the surrounding area was beautiful countryside,” he explains. “So as a kid I’d spend all day long on a bike getting lost in the woods. The album also features some of the most fiery and fresh guitar playing Weller has delivered in years. Does he ever regret casting the instrument aside for several years with The Style Council. But Weller’s judgement hasn’t always been the best. A few years ago he championed The Ordinary Boys, before frontman Preston went on Big Brother. “What happened to them, man?” he asks. “I thought he was a credible character, serious about what he was doing. Does the man who wrote In The City and Down In The Tube Station despair at the lack of protest songs among the modern Britpop bands? Although he was a card carrying Labour supporter in the 1980s, Weller has long since disassociated himself from politicians and was flabbergasted when David Cameron recently chose his class war diatribe Eton Rifles as a favourite tune. “Which part of the song didn’t he get?” he wonders, astonished. Although he’s now 50, Weller remains a style icon for many, despite having a belly that’s the result of a boozy lifestyle and blonde hair that’s been dyed for several years. “I prefer to call it colouring. I just think grey hair’s boring, although it obviously suits you, man,” he smirks. “I don’t feel any different now to when I was 30. I go to the gym a few times a month. I do try to make an effort, although I could do more. “We just got back from touring America and we’ve been away for seven weeks. Obviously we had a few nights out, as you do, but lots of mornings I’d be down the hotel gym. I’d see the band down there too and think, ‘This is different’. It’s quite nice actually that I come back from tour feeling fitter than when I went. New album Weller At The BBC is out on November 3. UK tour starts November 8. Next Entry Paul Weller Featured In December Issue Of Uncut!